Not all tattoos are meant to last forever and often we find ourselves wanting to have one or more removed. We are happy to offer the MedLite laser by Hoya Conbio as it is the state-of-the-art laser for removing tattoos. The MedLite laser is FDA approved for the use of tattoo removal. The MedLite produces a high-energy beam of light at four different wavelengths. Each wavelength targets specific ink colors. The energy from the laser beam passes through the skin and is absorbed by the tattoo ink. The intense energy breaks down the ink, which is then gradually removed by the body’s natural filtering system. 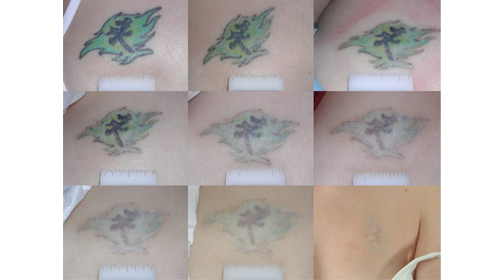 The significantly improved beam profile of the MedLite compared to previous generation lasers allows maximum energy to be delivered to the tattoo ink without damaging the surrounding tissue. 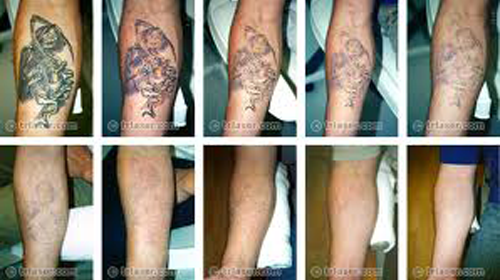 A professional tattoo will require ten to sixteen treatments for complete removal. The number of treatments will vary, depending on various factors including the type, amount, color, and depth of the tattoo ink. 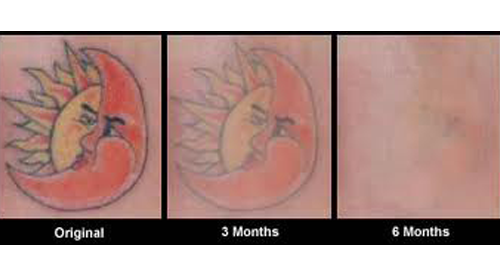 The laser will remove all tattoo colors, but some colors are more difficult to remove than others. Dark blue, black and red inks will fade faster than green, yellow, or sky blue inks. Some people will experience a greater degree of discomfort than others. We use a topical analgesic cream and an air cooling machine to minimize discomfort. Most patients will see better than 95% removal. It is impossible to predict the degree of removal on any given tattoo because there are so many different brands of tattoo inks. As with most procedures we perform, we highly recommend visiting several offices for multiple opinions before scheduling your appointment. Whenever someone is going to use needles, knives or lasers to treat your skin, multiple opinions are adviced. When seeking the right office to treat your tattoo, there are 3 main questions to ask at your consultation appointment. These are important things to know prior to scheduling an treatment. Is the office operating under the direction of a licensed physician? Is the equipment being used to treat your tattoo FDA approved for use in the United States? How many years experience does the technician have who will perform your treatment? Always be sure to trust, but verify, the answers your receive to these 3 questions. Call us to schedule a complimentary consultation and let us show you how the MedLite Laser will be the best laser for successful tattoo removal. Cost – $100 per square inch. Maximum $500. I came to Clinical Aesthetics of Tulsa over a year ago in hopes to remove a very noticeable tattoo. Susan not only has helped me gain my confidence back after such a successful series of tattoo removal, she has eliminated all questions I have ever had when it comes to my skin care regimen. I have now had multiple procedures done with the most recent being a photo facial. I can not stress anymore how wonderful Susan, Dr. May, Tracy, Brynda and all of the staff are at CAOT. If you are looking for professionalism and attention to detail, you don’t need to look any further.